02: PhotoBlocker Spray : Buy 2 Get 1 More Can FREE + FREE Shipping. 50-70% OFF Discounts Apply ! 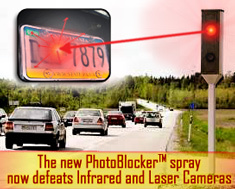 BUY 2 CANS OF PhotoBlocker Spray, and GET ONE MORE FOR FREE! Also Includes FREE SHIPPING and your FREE E-BOOK "Fight Back: How to Beat Red Light and Camera Tickets in Court!"